Caribbean Stud Poker is one of the simpler forms of stud poker and played only against the dealer. There is no bluffing involved and this makes it an ideal format for solo online play. Stud poker is a variant of the game in which only the cards in a player’s hand are used – no draw or community cards are involved. This version from Net Entertainment also features a progressive jackpot. 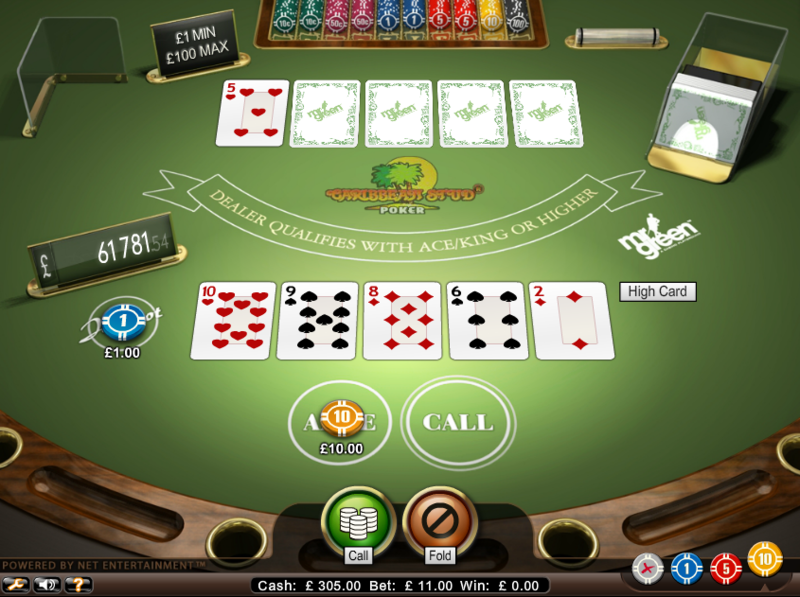 The screenshot above shows what will greet players to begin with; the ‘ante’ and ‘call’ spaces are at the bottom and progressive jackpot total is displayed on the left hand side. The player chooses a chip size and places it on the ‘ante’ space. To take part in the progressive jackpot you must place a £1.00 bet on the ‘jackpot’ circle. Five cards are dealt to both the dealer and the player. Yours are face-up while one of the dealer’s cards is shown. The player chooses to remain in the hand by pressing the ‘call’ button – this doubles your bet – or folding. Hands are compared according to standard high poker rankings but the dealer automatically loses if his hand contains neither a king or ace. If the dealer does not qualify the player receives 2/1 on the ante and the remaining bet returned. The dealer wins if his cards contain a king/ace and a stronger hand. A draw returns the stake to the player. This is a good-looking version of Caribbean Stud Poker and the additional touch of the progressive jackpot is very welcome. Playing a sensible strategy will mean an RTP of 97.42%.